Chile is a long, narrow country that is geographically and climatically dominated by the Andes to the east and the Pacific Ocean to the west. Chile's vineyards are found along an 800 mile stretch of land from Atacama Region to the Bio-Bio Region in the south. The climate is varied with the northern regions being very hot and dry compared to the cooler, wetter regions in the south. The close proximately to the Andes help create a wide diurnal temperature variation between day and nighttime temperatures. This cool drop in temperature is vital in maintaining the grapes' acidity levels. There is not much vintage variation due to the reliability of favorable weather with little risk of spring time frost or harvest time rains. So far, Chile has remained free of phylloxera disease, which means that the country’s grapevines do not need to be grafted. Harvest typically begins at the end of February for varieties like Chardonnay with some red wine varieties like Cabernet Sauvignon being picked in April and Carmenère sometimes staying on the vine into May. One of the best value-prices, big and rich wines you're likely to find. The nose impresses with potent blackberry, cedar and marzipan aromas, and the palate bridges the gap between power and elegance. 95 points Wine Enthusiast (score to be released to the public in the beginning of 2012). 91 points Wine & Spirits: "A blend based on old-vine carmenère, this latest vintage of Clos Apalta is faithful to its style: a tremendously ripe wine. A crisp, dry Sauvignon Blanc that makes an excellent food wine. Its flavors of pineapple, figs, and grapefruit are accompanied by loads of minerality; even without food you'll soon be reaching for a second glass. 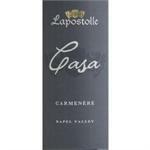 The palate is ripe, tannic and structured, with blackfruit flavors, a touch of herbs and espresso. Long and herbal on the finish, with a smooth fade...91"
This is a fresh, palate-friendly wine with notable tannins (read: pucker-power), boasting colors of garnet and scents of ripe cherry. 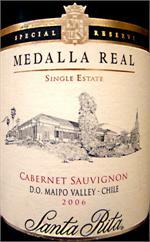 This is a full-bodied Cab offering flavors of cherry, chewy blackberry, hints of vanilla and consistent oak. Toasty caramel pairs with citrus on the nose, while the brilliant straw color promises pear & stone tastes. Not oaky, this tasty Chilean white is fresh & a little racy! Impressive wine For the price! A blend of 93% Cabernet Sauvignon, 5% Merlot and2% Cabernet Franc. Intense ruby red in color. Red and black fruits combine with tar and menthol undertones, together with vanilla and toast undertones from oak maturation. Ratings of WS 91, WE 90! 93pts Wine Spectator. “Santa Rita’s purple-colored 2007 Triple C is a blend of 65% Cabernet Franc, 30% Cabernet Sauvignon, and 5% Carmenere. It offers up a bouquet of pain grille, pencil lead, cinnamon, sage, thyme, blackcurrant, and blueberry. Dark ruby red, with attractive purple tones. The nose, elegant and layered, reveals pure and delicate aromas of ripe cassis, blackberries and wild strawberries, nicely associated with vanilla, spices and coffee beans.